If airline groups can be thought of as families, then profitable British Airways is the strait-laced older sister of the petulant, unreliable and loss-making Iberia. BA has learnt from its hedonistic, free-spending youth and matured into the sensible, trustworthy one. Parents are not meant to have favourites, but it is clear that IAG looks on BA with a glint in the parental eye, while Iberia is constantly being scolded. IAG refuses to buy its irresponsible Spanish child any new toys until it mends its ways, while it now trusts her British sister with shiny new 787s and A350s. Nevertheless, BA should not allow itself to feel too smug. It remains much more dependent on a single hub (Heathrow) and on a single intercontinental market (North America), but less connected to domestic and European markets than its peers. Moreover, cost benchmarking points to the need for a reduction in CASK, which it has not managed since before the merger. As any parent knows, it is not just the children that are most visibly struggling that need attention. In contrast to its sister carrier Iberia, British Airways has enjoyed a period of growth under IAG ownership after many years of decline. From 2001 to 2010, BA’s annual passenger numbers fell from 39 million to just short of 31 million. Numbers have risen in each of the post merger years, reaching almost 38 million in 2012, while Iberia's capacity has been cut. Within the context of an overall capacity cut for IAG in 2013, the group plans to increase BA’s capacity, in ASK terms, by almost 3%. This would take its share of IAG’s total ASK capacity from 69% in 2010, the year before the merger, to 76% in 2013 (excluding Vueling). Historical BA traffic figures that show passengers by region up until 2010, demonstrate that the decline in passenger numbers during the 2000s was almost entirely due to falling numbers on short/medium-haul routes, although this remains its most important region in passenger numbers. In UK/Europe, its passenger numbers fell from 27.6 million in 2001 to 18.4 million in 2010, while the Americas saw an increase from 6.8 to 7.3 million. Asia-Pacific also saw a decline, from 1.8 million to 1.4 million, while Africa and Middle East saw growth from 2.8 million to 3.5 million. BA’s decline on short/medium-haul routes was accompanied by the disposal or closure of a number of subsidiary companies in this segment, including Deutsche BA, BA Citi Express and BA Connect. BA also ceased franchise operations with franchisees BMED and GB Airways. It seemed that low-cost competition was persuading it to abandon all but hub feeder routes and a few niche point-to-point routes between key business destinations. Its own experiment with setting up an LCC, Go, ended in a management buy out and subsequent sale to easyJet (the latter also eventually bought BA franchisee GB Airways). In ASK terms, the Americas region (mainly North America) has remained BA’s most important region, while UK/Europe and Asia-Pacific have declined in importance. By 2007, UK/Europe had slipped to third place among BA’s regions ranked by ASKs, behind Africa and Middle East. As a result of BA’s falling passenger numbers through the 2000s, its share of scheduled passenger numbers at UK airports fell from 21% in 2001 to 16% in 2010, before its resurgence under IAG saw its share climb to 17% in 2011 and, helped by the bmi acquisition, to 18% in 2012. BA no longer separately reports its regional traffic data, so it is not possible to determine which regions have driven this resurgence (although OAG data suggest that BA has been growing again in Europe, even before the bmi acquisition after heavy cuts in the 2009-2010 period; and that is has grown capacity on North America). A comparison with the other two major European legacy flag carriers shows that BA has a much smaller share of the aviation market in the UK than either of Lufthansa or Air France in their home country markets. 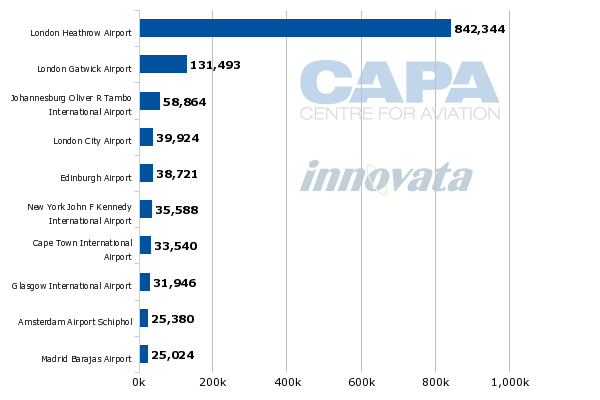 Using Innovata data for the week of 20-May-2013, BA has 20% of seats in the UK, while Lufthansa has 38% in Germany (43% with Germanwings) and Air France has 36% in France. Fellow IAG carrier Iberia has only 13% in Spain (25% with Vueling). BA is the most international of the big flag carriers, which means its network is the least domestic-focused. For BA, the domestic market accounts for just 16% of seats, while this figure is 21% for Lufthansa and 33% for Air France. For Iberia, it is 49%, even after some years of domestic capacity cuts, underlining the threat it faces in Spain, the most competitive of markets. BA also has the lowest proportion of its traffic on domestic/European routes among the four large flag carriers, with 64% of seats within the continent of Europe, compared with 80% for Lufthansa, 71% for Air France and 78% for Iberia. Again, this reflects the decline in BA’s short/medium-haul activities and also the strength of London Heathrow as an O&D market requiring less feed than rival hubs such as Frankfurt. Lufthansa’s seat capacity is not particularly domestic-focused, but it is very Europe-focused. This reflects the much weaker status of Frankfurt as an O&D market, with the result that Lufthansa has to gather traffic from across Europe in order to sustain its long-haul network. Almost half of BA’s intercontinental seat capacity is to North America, making it much more exposed to a single market than either of Lufthansa or Air France. It has a lower proportion of its seats in Asia than the other two and a higher proportion in the Middle East. Perhaps these two factors, plus BA’s lower dependence on transfer traffic, help to explain why it has tended to sound more relaxed about Gulf carrier competition than Lufthansa or Air France. Air France has the most diversified intercontinental network of the three, with a similar proportion of seats on North America, Latin America, Asia and Africa. BA’s focus on North America, together with the strong London market and capacity constraints at Heathrow, have helped to give it a profitable and defendable niche. However, this has also made it vulnerable to any weakness in the trans-Atlantic, a situation that has been helped by recent capacity constraint and the immunised alliances in this market. The merger with Iberia added strength in Latin America, but IAG still has a relatively low proportion of seats in Asia. BA is highly dependent on its Heathrow hub, with Gatwick taking less than one sixth of the number of BA seats at the main hub. The decline in short/medium-haul traffic through the 2000s, referred to above, was accompanied by a refocusing of most of BA’s hub traffic on Heathrow and a reduction in BA’s Gatwick operations to focus on point-to-point routes. The dependence on Heathrow is much greater than either Lufthansa or Air France have at their main hubs. While BA has six times the number of seats at Heathrow as at Gatwick, Air France has less than three times the number of seats at its CDG hub compared with Orly and, for Lufthansa, the ratio between Frankfurt and Munich is around one and a half times. BA has steadily grown its share of slots at London Heathrow by buying slots on the market where possible. Its share moved from the high 30% region to the low 40% region through the first decade of the century and jumped to 51% in the summer 2013 schedule as a result of its acquisition of bmi. With Iberia and oneworld partner American Airlines, its share is 55%. See related report: Heathrow Airport’s slot machine: hitting the jackpot again? At Gatwick the trend has been the opposite. BA’s slot holding has fallen from 32% in summer 2003 to 16% in summer 2013. At the same time, easyJet's share has grown from just under 7% to 41%. Flybe is in discussions that may lead to its selling its Gatwick slots, of which it owns 6%. Ryanair is known to have expressed interest in bidding for them and it seems reasonable to assume that easyJet will also be interested in extending its leading position. Norwegian Air Shuttle has recently established a new base at Gatwick and so might also be expected to make a bid. All of these LCCs would further increase the competition for BA at Gatwick if they were to acquire the Flybe slots. BA may be tempted to reverse its declining trend at the airport and to bid in order to resist this competition, although it is not clear what use it would make of them if successful. On 22-Apr-2013, IAG announced a firm order for 18 Airbus A350-1000 aircraft, plus a further 18 options. This came soon after the announced conversion of 18 Boeing 787 options into firm orders. IAG said that these 36 aircraft would be used to replace 30 747-400 between 2017 and 2023, while the additional 18 options could be used to replace further aircraft or for growth. BA had 52 747s at the end of 2012 and expects to reduce this to 43 by 2015. It will adjust their rate of replacement depending on market conditions and growth opportunities. See related report: Does British Airways’ 787 option conversion signal a return to a more expansionist capex policy? CAPA has postulated a possible delivery schedule for all aircraft to be added to BA’s fleet after the 787 order was announced and now update this below to include the A350s. BA’s 2012 operating profit of GBP274 million contrasted with Iberia’s operating loss of EUR351 million, but was a fall of GBP244 million compared with 2011. Reconstructing BA’s operating results on a calendar year basis for the years before the creation of IAG (BA used to have a March year end) shows that BA made a healthy 8.4% margin in 2007 at the pre-recession peak, but had tumbled to a GBP395 million operating loss by 2009, since when its profits have been up and down. Source: CAPA – Centre for Aviation, IAG, British Airways. The chart below shows the development of BA’s unit revenues (revenue per available seat kilometre, RASK) and unit costs (cost per available seat kilometre, CASK) since 2007. Cautious capacity growth has helped BA to increase RASK by around 20% over the period, although it is susceptible to changes in market conditions: RASK collapsed in 2009, when the recession hit hardest, and BA fell into loss. Ex fuel CASK fell only once in the past five years (2011) and has increased by 5% since 2009, since when fuel price increases have pushed total CASK up by 13%. BA’s return to profitability since 2009’s losses has been driven by RASK recovering by 22%, faster than the increase in CASK. However, in 2012, CASK was up by 6% and CASK only 3%, leading to a fall in profits for BA. Placing BA on a chart of unit costs (CASK) versus average sector length shows it to be on the wrong side of the divide between the big legacy flag carrier groups and the more efficient full service carriers (and much higher-cost than the LCCs). While its CASK is lower than that of the other big legacy groups, this is to be expected given a longer average sector length. Its intercontinental traffic focus means that it competes less on a head-to-head basis with the LCCs than do the other big European flag carriers. Nevertheless, any suggestion that BA has done all the necessary restructuring while Iberia needs all the remedial management care is not supported by this chart. IAG should not forget that it has more than one offspring in need of parental care and guidance. This one has the better prospects, but still needs nurturing. *Financial year ends as follows: Pegasus Airlines, airberlin, Turkish Airlines, Lufthansa, Aer Lingus, IAG, Iberia, BA, Air France-KLM, Finnair, Norwegian, Vueling Dec-2012; SAS Oct-2012; easyJet Sep-2012; Wizz Air, Ryanair Mar-2012, Virgin Atlantic Feb-2012. IAG profit guidance is dropped after first quarter loss, but can it still reach its previous target?